WordPress is a fantastic platform that offers rock solid stability 99% of the time. However, errors are an inevitability that no platform can outrun. In most cases, they’re easy to fix. However, corrupted files fall into a tricky category, since it can be challenging to narrow down their cause. Fortunately, there are plenty of ways you can deal with WordPress corruption issues even if you’re not 100% sure why they’re happening. In this article, we’re going to talk about some of the most common culprits behind corrupted files in WordPress, then we’ll teach you how to fix them using three different methods. Corrupted databases can lead to connection errors. Server failure. If your server goes down while WordPress is updating a file, it can become corrupted since it won’t save the changes correctly. Incorrect file permissions. In some cases, improper file permissions can lead to the malfunction of WordPress files. Errors with your version of PHP or your database software. Sometimes, an update to your server’s software can cause compatibility errors that lead to corruption in WordPress’ files and its database. It’s important to note that WordPress doesn’t explicitly tell you when some of its files become corrupted. In most cases, the corruption will lead to a broad variety of errors, each with their own message. For example, if your database becomes corrupted, you may not be able to even establish a connection. It may also be that WordPress can no longer locate one of its core files, which can render your installation unusable. With that in mind, if you run into a WordPress error for which you can’t find a specific fix, chances are it’s related to file corruption. If that’s the case, here are the steps you should follow. There are three ways to tackle corrupted files in WordPress. For the best results, you’ll want to approach these solutions in the order they appear. Plus, you’ll need to use a File Transfer Protocol (FTP) client for all three methods. We recommend FileZilla, but you’re free to use whatever program you’re comfortable with. Restoring a recent backup is the easiest way to fix plenty of errors. Backups can solve basically any problem you have with your website. Ideally, you’ll back up your site often, so you can simply restore it to an earlier version if anything goes wrong, without losing too much content. In other words, doing a full restore (of your files and database) is the perfect way to reverse corruption on your installation. If you have a backup plugin, such as UpdraftPlus, you should be able to restore your website from your dashboard using our previous guide on the subject. This process is simple – just select all the folders you want to restore and click on the Upload option within your FTP client. Then repeat the process for your themes (which go into wp-content/themes) and uploads (located in wp-content/uploads). After you finish all three rounds of uploads, you should be able to access your site again without errors. If you went through all this process from an old backup, remember to schedule regular ones in case it happens again! Your database can also get corrupted, which can break your WordPress site. If backups are out of the question (because you don’t have any recent ones), you should first look to repair your database. WordPress includes a built-in feature that enables you to do this, but it’s turned off by default. Technically, you can add that line anywhere in the file you want. However, it’s best to place it right at the end, so you can be sure it doesn’t interfere with the rest of the file’s code. 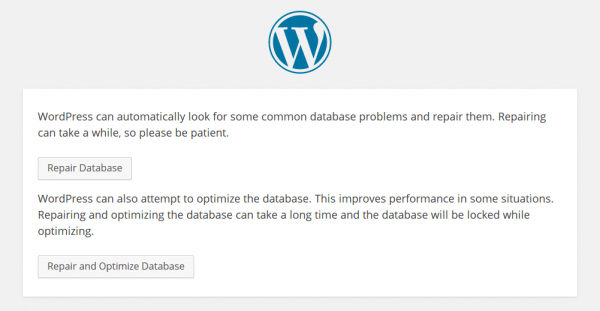 Once you’ve enabled WordPress’ database repair function, you can access it by navigating to http://yourwebsite.com/wp-admin/maint/repair.php. Now, wait for WordPress to work its magic. When the repair is done, you should be able to access your site without any errors. However, if your site is still facing problems, it’s time to try out method number three. WordPress core files are critical to your website’s functionality. If you couldn’t restore your website from a backup or repair your database, you’ll simply need to replace all of your WordPress core files. This process is rather straightforward, but it will cause you to lose any customizations you’ve made to any of those files. At this stage, your FTP client will ask you if you want to overwrite any duplicate files on your server. Choose “Yes” for all files, and sit back while everything uploads. This process should only overwrite your WordPress core files, and it won’t affect any plugins or themes you’ve downloaded. In fact, you can use this same process if you ever run into a situation where you need to update WordPress manually. When everything’s done, go ahead and try to access your site once more – it should now be working perfectly! Troubleshooting WordPress can seem intimidating, but in most cases, it’s rather simple. Once you identify what’s wrong with your site, you’ll likely find dozens of guides on how to deal with it. Corrupted file errors are a bit more complicated, since they can have many causes. However, you can still make short work of them if you investigate the problem methodically. Replace your WordPress core files. Any questions? Let’s talk troubleshooting in the comments section below! Article thumbnail image by I000_pixels / shutterstock.com. Thanks John for the information, it is very clear and helpful. The problem I’m having, which no one seems to be able to answer is, I can’t get into my WordPress dashboard even though I’ve changed my password and email recovery in Hostgators PHP My Admin / WP-users. I keep getting a ‘too many login attempts’ message, and Hostgator is pretty much useless in the help department..
Are you using some form of security plugin? If you are you could try deleting the directory, I would also check the contents of your .htaccess file (if you’re using one) and make sure that only the most basic information is there – https://codex.wordpress.org/htaccess will show you exactly what’s needed. Thanks. Does anyone know if this “repair database” option does exactly the same as the phpMyAdmin function? I’ve got a misbehaving woocommerce installation and nothing I’ve done via phpMyAdmin has fixed it. Hi Mark. Sorry to read that you’re having problems. If you’ve followed the advice in the article and are still experiencing difficulties, you may have a Divi issue. By getting in touch with us, we can ascertain your best course of action. Just what I was looking for, boy do I have problems and now I can repair them. Hi Laurie. Glad you found the article helpful. Learn this if you have the interest or spare time, otherwise, just get your WordPress website host to fix corruption problems. I recently had a database corruption issue. I just wrote a support ticket and my host fixed the problem. Good hosts also back up your site(s)regularly, which mine does and has saved me a few times when I have made changes that crash a site, but I use a backup plugin just in case. Are you at liberty to mention the hosting company. Hi Eric. It’s always a good idea to have a backup plugin in place. We also strongly recommend sending support tickets in the event of unforeseen issues. However, in many cases, learning how to fix corrupted files can be useful in the event that a quick response is not forthcoming. Thanks for your comment. We have also been facing difficulties with importing Divi Layouts, so it’s very possible that we need to configure something with the WordPress. Please help us by writing an article on the issue! Very useful, will be using this on an old site of mine. Thanks for posting. Hi! I’m a little perplexed. In option 3, won’t uploading a fresh “wp-content” folder override any themes or plugins I have in the existing wp-content folder? Hi Ariana. It will, unfortunately, yes. This step is more of last resort rather than solid fix, and will hopefully only need to be used on rare occasions. Thanks for the extra insight on DB repair. I have been a UpDraftPlus backup user for quite a while and it has saved me a lot of time. My standard practice is to store the backup files off server in Dropbox, Google Drive, or OneDrive. This way I can always access the files and do an FTP if needed. No problem Jeff 🙂 Thanks for the comment. Thanks for the concise but effective guide. Well that’s an excellent guide for the newbies having large websites. Better to buy out the jetpack backup service that is easy to use. What is the jetbackup and is it free. How does it solve my problem, which I thought was a fairly simple one. Is there way I can just paste in the correct file or just the part that’s missing? The basic version of Jetpack is free. However, there are also premium versions with additional features. If you have followed the steps in the article and are still encountering issues, we recommend contacting your host for further assistance. Is there a way I can paste in the correct file in my website, or even the missing part? Option nr 3 worked for me, thank you so much for this useful post! I managed to revive a forgotten travel blog.